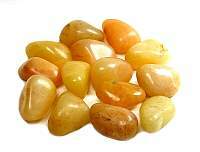 Love it, good size nice color great shape so pretty very happy with it I recommend buying from Raven..
Nice size stone -- the color is more orange than yellow -- I keep confusing it with my orange calcit.. These have a sweet energy to them. They're a great addition to my crystal collection. I love the sunny color of these aventurine. They are warm and inviting. I'm glad I purchased several.. These have a sweet energy to them. They're a great addition ..